Denna produkt ger dig 794 bonuspoäng. Vagnsset med 6 godsvagnar 'Bundesliga', set 3, totallängd över buffertar 69 cm, epok VI. Prototype: Car set consisting of 3 container transport cars and 3 refrigerator cars. Each car decorated with the club logo of a soccer club for the 2017/2018 season. 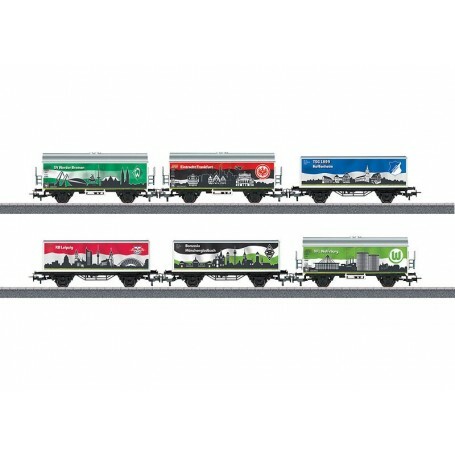 Model: This car set is for 6 soccer clubs and consists of 3 container transport cars and 3 refrigerator cars. Each car has a fictitious paint scheme and lettering with the club logo for a soccer club for the 2017/2018 season. The container cars have a 30 ft. container superstructure. The cars have Relex couplers. All of the cars are individually packaged. Length over the buffers per car 11.5 cm / 4-1/2'. DC wheel set E700580. The 36655 diesel locomotive from the Märklin Start up assortment and the 44812 and 44813 car sets go with this car set.